This is the headline night of Miller Music Amplified, a three day music event in the Argentine capital of Buenos Aires, featuring a headline performance from UK band Bastille alongside a series of DJs who made their names in the Miller SoundClash competition, which was the predecessor to Miller Music Amplified. It's only the second time that Bastille have performed in Argentina, and it's their first time in South America since 2015. Such is the excitement at their presence in the city that fans – many with song lyrics or logos tattooed on their arms – were waiting for them at the airport. "Latin American crowds have a really great energy," Bastille's affable lead singer Dan told us earlier in the day. "It's not the easiest touring route, so I think the crowds are really excited to see us here." 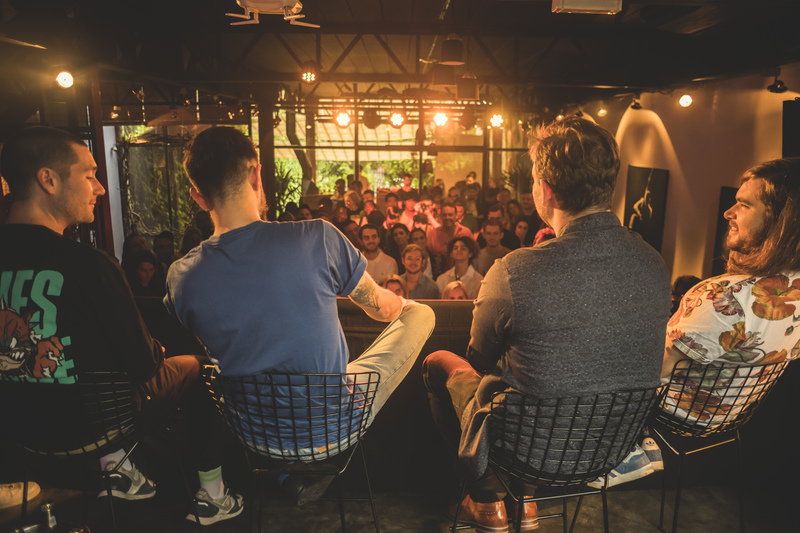 Miller Music Amplified kicked off 24 hours earlier when over 100 guests – a combination of DJs, influencers and competition winners from all corners of the globe – arrived at the Miller Music Amplified Hub. The hub acts as a dedicated check-in and social area, featuring floor to ceiling cabinets filled with Miller Genuine Draft, a main area equipped with a pumping sound system, DJ booth, bar and outdoor terrace. After a friendly greeting at the check-in desk, we're whisked through the main room where Agustin Gandino is among a number of former Miller SoundClash finalists who have arrived. It's not long before he's joined by Guille Preda and 2017 winner DJ Vane. It's Gandino who takes to the decks in the hub first, soundtracking the catch ups and welcomes. From the slick, modern environment of the Miller Music Amplified Hub, we are transported across town to a traditional mansion house for a Welcome Party. The space is visually spectacular, evoking images of rock & roll parties in musician's mansion. The traditional interior architecture is paired with instantly recognisable paintings including Grant Wood's 'American Gothic' and Leonardo da Vinci's 'Mona Lisa' - both cheekily accompanied with bottles of Miller Genuine Draft. It's a smart touch that everyone notices and comments on as they move through the venue. One of the defining features of Miller Music Amplified is musical diversity, and this is evident at the Welcome Party. As we arrive, the room is soundtracked by multi-instrumentalist Vale Rosales. The Honduran's one-man performance across numerous instruments is as much show as it is soundtrack and the early arrivals are transfixed by the energy of the performance. "One of the defining features of Miller Music Amplified is musical diversity"
Local reggae and ska ensemble Paprika Band increase the level once again, moving through the crowd, dancing, playing their instruments from supine positions and generally creating an atmosphere of participation and fun. Rumour has it that they were booked after being seen performing outside the venue during a previous research trip. A great find. Former Miller SoundClash champions Tom & Collins and Vane conclude the night, before buses transport the guests back to the hotel ready to rest up ahead of day two's events. Palermo Soho - a district of Buenos Aires filled with smart bars, cafes, shops and narrow cobbled streets - is the location of Palermo Clubhouse. The indoor outdoor venue boasts a pool and multiple levels. The inclement weather conditions have ruled the pool out of action, but the party is in full swing indoors. Following on from last night's performance 2017’s Miller SoundClash champion DJ Vane is demonstrating the abilities that won the admiration of the crowd and judges of the competition. 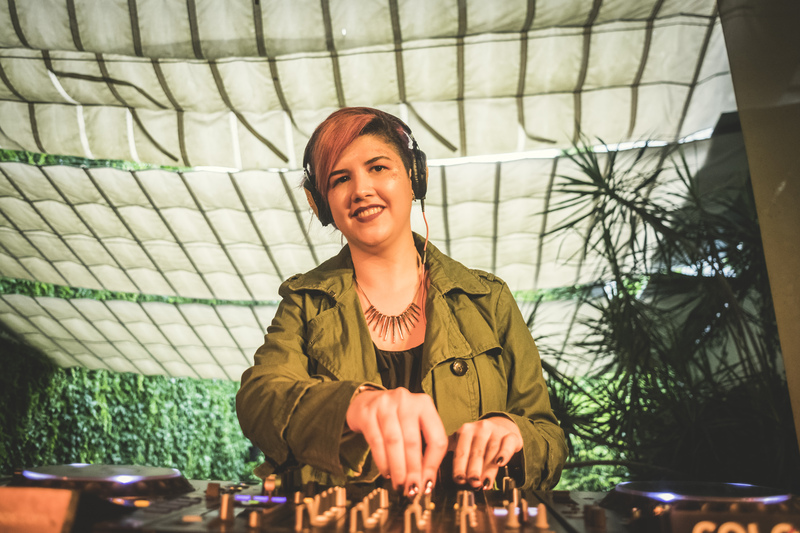 She weaves through various styles of percussive house music - familiar vocals or hooks are never far away but are often teased in and out rather than delivered in full. The effect mesmerises the crowd and the mood is strong as she drops ‘Black Belt’ a currently unreleased cut produced in collaboration with last year’s Miller SoundClash runner up, Jayboo from Brazil. We catch up with Vane as she comes off the decks, visibly delighted with the response to her performance. Relating it to her winning performance in Las Vegas last summer she observes a clear distinction. "It's very different," she tells us, "it's more intimate and I feel more comfortable with my sound here. The crowd were close and it was very cool!" As people move inside, away from the booth, Bastille are presented on the other side of the room. Pre-supplied questions are drawn at random from a hat during an improvised Q&A session. The questions, which had been submitted at random by guests on the first night, covered a range from the musical to the surreal. One question requested the presence of Bastille as the house band at an upcoming wedding. Laughing and in good spirits the band hastily (certainly not bindingly) agreed. It’s a warm and genuine moment that sums up the spirit of the event. 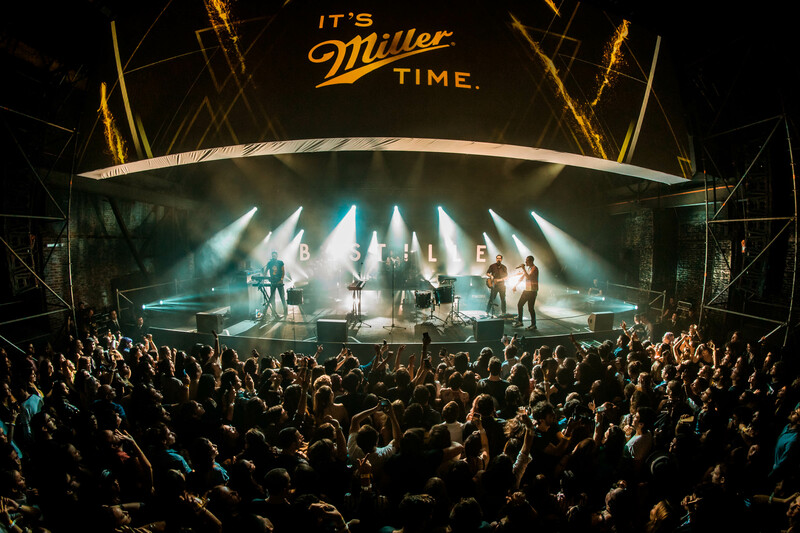 Following the Q&A, Bastille leave the stage and move into the crowd where they share drinks and mingle with the Miller Music Amplified guests. Drummer ‘Woody’ heads onto the decks as the rest of the band hang out on the dance floor. Argentine DJ Sofia Castañon closes the welcome party with a set of upfront tech house before the waiting buses take us back to recharge ahead of the main event this evening. And so, back inside the cavernous, red brick, industrial building in La Boca. The curtain drops to the floor exposing the venue for the first time. Vast, projection-mapped walls surround the venue on three sides, surrounding a golden mirrorball (also projected) in the middle of the room. Performers swing from the rooftop on either side of the suspended Miller bottles. It's a jaw-dropping sight and the energy in the venue lifts at once. 2014 Miller SoundClash finalist Guille Preda, from Paraguay, is providing the soundtrack to this visual experience, working his trademark selection of mash-ups and high-energy reworks from a large side-stage DJ booth suspended high above the swelling crowd beneath him. When silence descends over the venue and the lights drop, it can mean only one thing. A large tower is moved into the middle of the floor as the crowd surges towards the front of the stage. A countdown begins on the screens that surround the venue. Counting down from ten, we hear at least six or seven languages bellowing the numbers around us. When the countdown reaches zero, Bastille's lead singer Dan is lifted onto the central tower, the stage is drowned in light and a huge lighting installation – built around the band's triangle logo – moves into position above the platform. Kicking off with ‘Quarter Past Midnight’ the band are tight, precise and full of energy. Watching them working the stage and – in the case of Dan – many other areas of the venue too, it’s clear that they are thriving in this exceptional location. Speaking to us earlier in the day, the whole band had been visibly excited. “We've not played a gig this intimate in a while and the production is going to be out of this world,” they had predicted. Working through a selection of their biggest tracks across their first two albums in addition to 'Happier' (their collaboration with Marshmello) and a stunning cover of Craig David's 'I know You' the showmanship is breathtaking. As they sign off with 'Pompeii', arguably their most iconic track, the crowd are vociferous in their appreciation. "Thank you all so much for coming out tonight", Dan calls into the microphone and the crowd respond in rapture. The final night brings more surprises. Following another journey across Buenos Aires we are delivered at what appears to be a subway staircase. 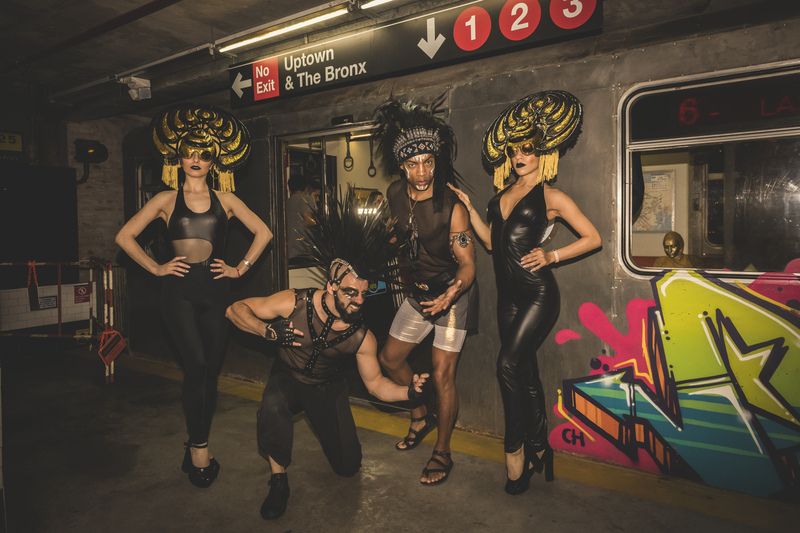 Walking down the stairs we're surrounded by artefacts from a New York subway station, turnstiles, barriers, train carriage and all, before the room opens up into the bar the locals know as Uptown. This crazy, unique venue is rendered even more exceptional through the presence of entertainers who work through the space creating a visual spectacle as Argentine DJ SRZ moves the floor with her bumping, bass and groove driven house aesthetic. The night - and in fact the Miller Music Amplified experience - concludes in fitting fashion with a closing set from the DJ who was first on the decks in the hub on day one, Agustin Gandino. After a thrilling three days in Buenos Aires, it’s time for the guests - and DJ Mag - to make their way home. The debut year of Miller Music Amplified will go down as a huge success. Building on a musical legacy created from 4 years of Miller SoundClash, Miller Music Amplified brings wider musical diversity to the concept and the stunning city of Buenos Aires provided character, distinction and passion too. Want more? Check out 14 Incredible photos from Miller Music Amplified in Buenos Aires. 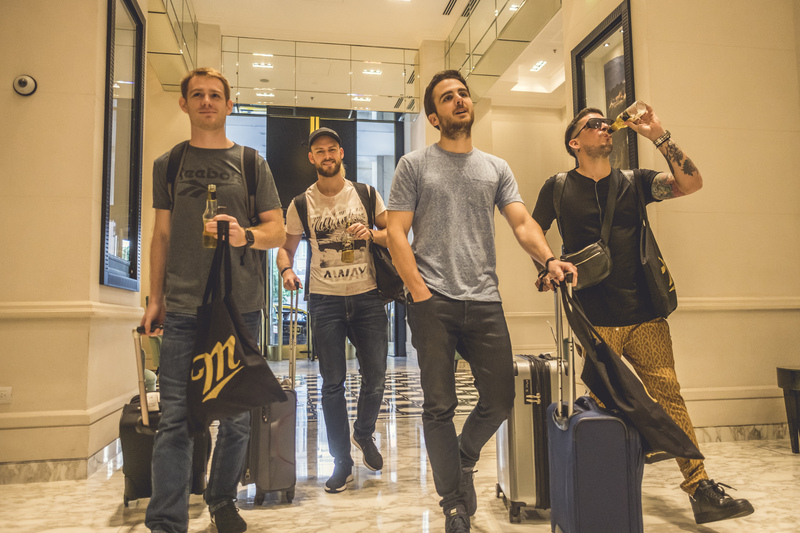 Watch out for a forthcoming piece on the Miller SoundClash DJs and their journey to Miller Music Amplified.